Midway through the 1901 season, in the midst of student discontent, on November 26th, George Woodruff tendered his resignation as coach in a formal letter to the head of the Athletic Association, effective as of November 29th. It was accepted seven days later, on December 3rd, 1901. Disheartened by Woodruff’s resignation, the Red & Blue played poorly in their next game, losing to Cornell 6 – 23 on the 28th. This was Woodruff’s last game and his fifteenth defeat in nine years of coaching. He had tied twice, and won the remaining one-hundred and twenty-four games. On the 1st of December most of Penn’s graduate coaches resigned in protest over Woodruff’s retirement. They declared that the football team’s decline was due to the players, and that without Woodruff the team would play much worse and lose more often. Their objections went unheeded and two days later, on December 3rd, Woodruff’s resignation was formally accepted. The next day, the members of the football team sent a letter to the Football Committee unanimously requesting that Woodruff be reinstated as coach. After leaving the University of Pennsylvania, Woodruff went on to enter law, and later politics, serving as an assistant attorney general of the US, as acting Secretary of the Interior, as a federal judge in Hawaii, and as Attorney General of Pennsylvania. He died in 1934, in Harrisburg, Pennsylvania, at the age of seventy. The football program continued without him. 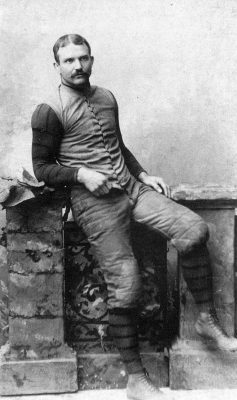 In 1902 Dr. Carl S. Williams (Medical School ’97) introduced a revised graduate coaching system in which he served as head coach while being aided by a group of other alumni who served as assistant coaches. This system reduced the damage that the removal of any one coach or assistant coach could have on the team, making it easier to replace coaches if the need arose. Under Williams, the Red & Blue beat Harvard in 1904, and gradually reclaimed the reputation they had gained at the end of the 19th century.